Simple is Good. And, it Works. A very wise friend of mine (Ms. Erin Baker from Baker’s Breakfast Cookies) recently shared one of her secrets to keeping on track and on target with goals. A notebook and a list. It’s that simple. Ms. Erin plans out her day every evening before leaving the office. 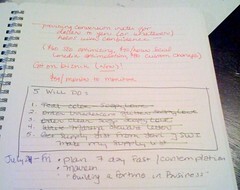 She estimates how much time it will take to get something done fills out her day, via the notebook and the list. done – not that day at least. I’ve tried various productivity methods (‘4 Hour WorkWeek‘ and ‘Getting Things Done‘) and they haven’t quite worked for me. They don’t have quite enough flexability for my zany, madcap work flow. But, I do need something to keep me in line or else the ‘zany’ takes over and nothing productive really gets done. The list is working for me. I’m on my 2nd Chronicle Books Hammerpress Notebook (love it! ), try to use special pens (pink, bright green, fun colors!) and derive immense satisfaction when I cross something off the list. The concept doesn’t have a book to explain it and there’s no daily blog to explore it. But, simple is good. And, it works. Previous Post: "It was beautiful. Loved it." Love the simplicity of this. I live by my daily journal and find my best days are when I go down the list. Hi Erin here, just looking at the comments on Simple is Good. to answer the question of what do i do with larger "to do" items? I place them on the left page with notes. This "to do" list will become your bible of information. Nothing beats puting pen (or mechanical pencil in my case)to paper to make your declaration to get things done. i just found out the meaning of that today ha ha! This works for me quite well. If I don't have a list nothing much gets done. When I have a list, I tend to stay more focused and definitely get more done. I have big whiteboard in my office with my quarterly 'rocks' (goals, accountabilities, whatever you call them) and then the daily list just has 5-7 things on it that each day move me forward on the rocks. I also have an email accountability group that I email every Monday with a review of how the previous week went on those rocks/priorities/quarterly goals. So the biggies are still out there – they just don't get all put onto my daily list as a huge chunk. My husband has been telling me to make a list for 8 years. It truly is the best way to maintain sanity and get things done. very cool- i'll have to try this! it is amazing how such a simple thing is so effective. I just started reading Getting Things Done and now I see this blog post. What do you do for the itnes that take a while and don't go on the daily list?